24.3-megapixel APS-C image sensor: Create images of astounding beauty that surpass your expectations with Sony’s newly developed 24.3-effective- megapixel APS-C image sensor. The same size as found in most DSLRs, this sophisticated sensor offers high sensitivity in dimly lit environments and strikingly attractive foreground and background defocusing. You’ll enjoy the increased light collecting efficiency of a gapless on-chip lens structure, extremely low noise throughout a wide sensitivity range of ISO 100 to 25600, and superb corner-to-corner image quality with lifelike color, supreme detail and smooth tonal gradations that reveal every nuance of your scene..
BIONZ X™ image processing engine: Astonishingly fast, Sony’s sophisticated BIONZ X™ image processing engine reproduces textures and details in real time as seen by the naked eye. The resulting images are remarkably realistic with especially rich tonal gradations and a natural three-dimensional appearance. Whether shooting still images or movies, visual noise is nearly imperceptible, thanks to further advanced area-specific noise reduction. Detail reproduction technology delivers more finely detailed textures while diffraction-reducing technology optimizes the performance of any lens you mount to enable advances such as finer details at small aperture settings..
Full HD movies: Press the MOVIE button to start recording beautiful movies that are notable for their sharpness and lack of visual “noise”—in your choice of 60p/50p, 60i/50i or 24p/25p*. New improved Fast Hybrid AF provides remarkably fast and accurate autofocusing and tracking while shooting movies. You can also use P/A/S/M modes to achieve maximum control over how the image looks, and zoom with extra clarity, courtesy of Clear Image Zoom. *NTSC/PAL. X™ data processing, more advanced AF algorithms and optimized control of the lens drive delivers approximately 35% faster performance than in previous systems. 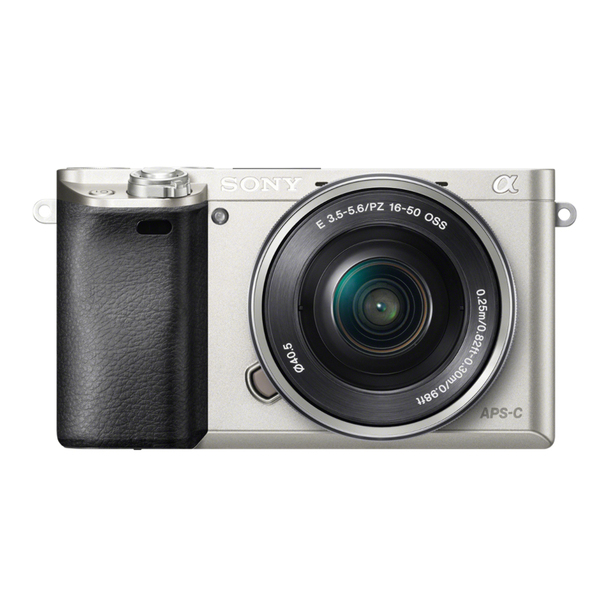 *Among interchangeable-lens digital cameras equipped with an APS-C image sensor as of February 12, 2014, based on Sony research. Measured using internal methods with an E PZ 16-50mm F3.5-5.6 OSS IS lens mounted. CIPA guideline compliant..
plus the capture of fast-moving subjects anywhere on the screen, as well as improved scene recognition and subject size detection..
11 fps continuous shooting with AF tracking: When your subject is moving fast, 11 fps continuous shooting with superior AF tracking performance ensures you capture the decisive moment. This feature makes the most of the superb tracking performance of Sony’s wide-area 179 phase-detection AF points to accurately track your subject anywhere on the screen.. Eye AF: Even when capturing a subject partially turned away from the camera with a shallow depth of field, the face is sharply focused thanks to extremely accurate Eye AF. A green frame appears over the prioritized eye when focus has been achieved..
AF mode: Matching the focus mode to the subject assures super-sharp results. The 6000 is the first E-mount camera to offer AF-A, and displays the active AF points even in the AF-C mode so you can easily check if you are focusing on the intended subject..
High-resolution OLED Tru-Finder™: View every scene clearly and naturally on the bright and accurate OLED Tru-Finder™ viewfinder, which offers 100% frame coverage. The new optical system with four double aspherical lenses provides a wide viewing angle of approximately 33° and clear visibility from corner to corner. Clear details, rich tonal gradation, and high contrast are yours in both dark and light environments, thanks to an advanced OLED design that lets you more faithfully preview defocusing, exposure, and other effects. You can also fine-tune the focus by taking advantage of MF Assist and a helpful Peaking function, as well as adjust brightness in five steps to match the shooting environment.. Swift, intuitive operation: Controls are refined for intuitive DSLR-style operation while viewing scenes through the viewfinder. The mode dial enables quick selection of shooting modes with your thumb, while the control dial and control wheel make it easy to set various parameters..
Customizable buttons: Button customization lets you shoot just the way you like for greater speed and convenience. You can assign any of 47 functions* to any of 7 buttons (including 2 dedicated custom buttons), and assign up to 12 functions to the Fn button for quick access. *Some functions can only be assigned to certain buttons..
Tiltable 3” LCD screen: Shooting comfort is enhanced by a 3” LCD screen that smoothly tilts to accommodate everything from low to high-angle shooting. This tilting flexibility combines with the camera’s compact mobility to greatly expand your shooting options..
Customizable UI: The User Interface takes on many of the features of A-mount cameras to enable smooth, personalized operation. Quick Navi Pro displays all major shooting options for quick confirmation and adjustment. The Fn button also enables swift access to preferred features..